One-step topical water-based HydroGel spray that cleans wounds, treats infections and kills bacteria including antibiotic-resistant MRSA. Use to treat topical infections and wounds, hot spots, rain rot, outer ear infections, yeast infections and rashes. HydroGel is designed to slowly evaporate, there is no need to wipe away film or residue from previous applications. Vetericyn HydroGel is based on Microcyn technology. Vetericyn HydroGel kills antibiotic-resistant strains of bacteria as well as fungi, viruses and spores. 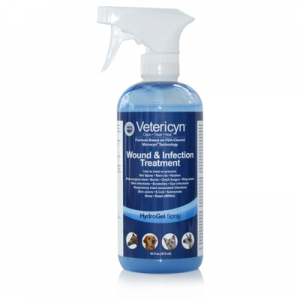 An oxychlorine compound similar to that produced by the animal’s immune system, Vetericyn HydroGel will not harm healthy tissue. Being pH neutral, it will not sting.